And on a rainy weekend I analyzed Niels Teusink’s public domain Phyton script unwrap.py and used it as a starting point for the development of a PL/SQL Unwrapper for SQL Developer. Pete Finnigan’s How to Unwrap PL/SQL. Pete provides a lot of useful resources on his blog and has shown in this post, that he owns unwrappers for 9i and 10g, which should be capable to handle every wrapped code. …you have to pay attention to not save the unwrapped code by accident. 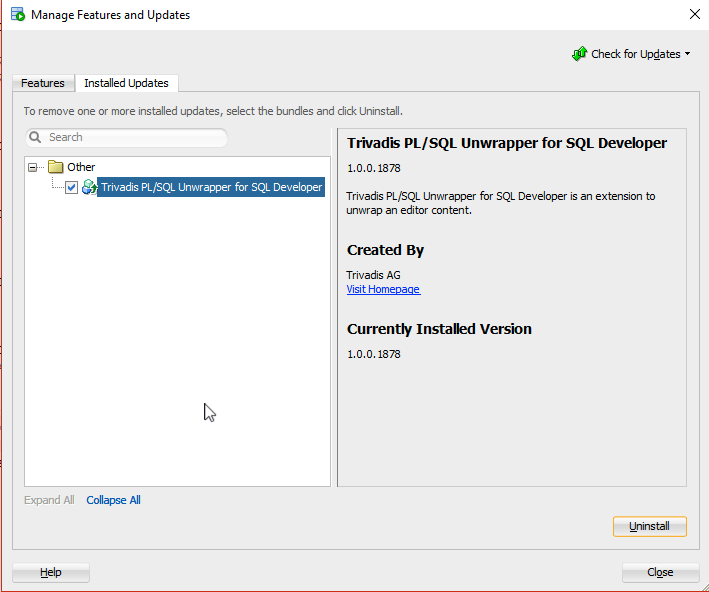 Grab your copy of Trivadis PL/SQL Unwrapper from the download area. I hope it is useful. Thanks a lot, saves a lot of time! Awesome. I don’t need to go other places to unwrap the packages. I have all that I need in my SQL Developer tool. Hi Phillip – Thanks a ton for this unwrap extension to SQL Developer , saved me so much time and effort! Kudos to your efforts! You have to start SQL Developer and install the downloaded Unwrapper_for_SQLDev_0.1.1.zip file. Please follow the instructions under “Installation” at the bottom of https://www.salvis.com/blog/downloads/plsql-unwrapper-for-sql-developer/. See also the FAQ section, specifically https://www.salvis.com/blog/faq/i-cannot-install-any-extension-on-windows/ if you are using Windows. Do you plan to develop Oracle 9i unwrapper? You’re welcome. No, I do not plan to provide a pre 10g unwrapper in the near future. HI, I have downloaded the jar file, but unable to configure/install the unwrap utility into sqldeveloper. I am unable to find the procedure to do that as you specified in Installation section. Can you please help me on this? You should get a zip file and not a jar after download. Please configure your browser to suppress unzipping files after download. Regarding the installation instructions, see section “Configure Update Center” in PL/SQL Unwrapper for SQL Developer. I am not able to unwrap a package in SQL Developer after adding your extension. I am using SQL Developer 4.1.1. “Could unwrap this code . Most probably it was not wrapped with Oracle 10g , 11g and 12c wrap Utility. I assume that the error message is accurate. Unwrapping is not supported by this extension when the code was wrapped with an Oracle 9i wrap utility. 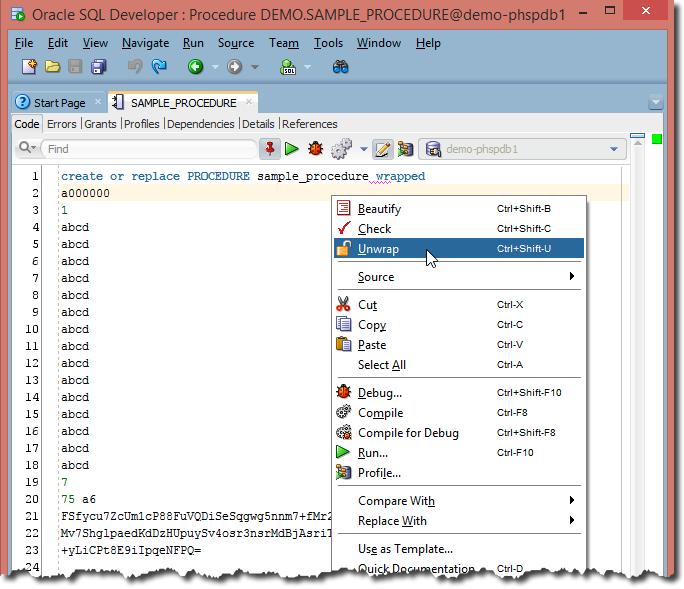 For “Check” you have to install PL/SQL Cop for SQL Developer. “Beautify” is another SQL Developer plugin (a formatter) which is not yet released. Thank you so Much for your Efforts. It really helped. Just one question: How did you take that snapshot of screen? I mean Cutting Edges on the Bottom (0r any side of the image) ;-) What tool/utility you used? Please tell me the way. I googled it but could not able to find out. You’re welcome. I’m using Snagit from TechSmith. I tried to install your extension into my Oracle SQL Developer v. 3.2.20.10 by referencing the URL http://update.salvis.com/ as noted in your instructions. The extension downloaded, but the extension functionality doesn’t show up. Error: ESDK version 2.0 is too high. Maximum supported version is 1.0. I’m not sure what to try next in order to resolve this issue. I would appreciate any suggestions you might have. SQL Developer 1.x, 2.x, 3.x are based on the Extension Software Development Kit (ESDK) version 1. SQL Developer 4.x requires the use of ESDK version 2. Unfortunately these versions are not compatible. So I decided to support the newest SQL Developer version only. I suggest to update to the latest SQL Developer version (currently 4.1.5) since this is a prerequisite for this extension. Thank you for your assistance, Philipp! Look at the Nils Teusink’s Python script unwrap.py and the links mentioned above. The work from David Litchfield, Pete Finnigan and Anton Scheffler are very helpful. but don’t see any effect after restarting neither messages in extensions log. The extension should work on 4.1.5. In fact I’m successful using it on Windows and MacOS. Which OS are you using? How have you installed the extension? Have you followed the instructions at the bottom of Configure Update Center? If you are on Windows, please have a look at the FAQ I cannot install any extension on Windows. Windows Server 2012 R2. Check For Updates -> Install From Local File. Then New Installs/Other/Trivadis PL/SQL Unwrapper for SQL Developer, Finish, Restart and… nothing. SQL Developer seats on C:\sqldeveloper, I’m administrator myself and tried to “Run As Administrator”. C:\sqldeveloper is ok, no need to run as administrator. Installation procedure looks good as well. Do you see the extension in the About or features dialog as shown below? If not, do you see some related logging output under “Views->Log” after the installation/restart? In “C:\sqldeveloper\sqldeveloper\extensions” you should find the file “com.trivadis.unwrapper.sqldev.jar”. It should have been extracted from the ZIP file during installation. That’s all what is required for a successful installation. However, there are cases when SQL Developer’s System cache is corrupt. You may either delete your settings completely (folder C:\Users\YOURNAME\AppData\Roaming\SQL Developer\system4.1.5.21.78) or the cache (folder C:\Users\YOURNAME\AppData\Roaming\SQL Developer\system4.1.5.21.78\system_cache). Please export connections and other settings before you do so. Hi Philipp, thanks a lot. Checked configuration, cfu_bundles.info was the same as cfu_bundles.extras, fixed it. Jar file on its place. Deleted whole \AppData\Roaming\SQL Developer\system4.1.5.21.78, restarted, reinstalled, restarted again. Nothing. One suggestion: my Oracle box isn’t connected to the net, even have no net card. Can it affect? this tool gives me an error message that ‘NOT A VALID CODE OR INCOMPLETE’,but it runs on my system. please anyone unwrapp this procedure and send it my mail(sahrupesh12@gmail.com)…. Could not unwrap this code. Most probably it was not wrapped with the Oracle 10g, 11g or 12c wrap utility. The error message is correct. This coded has been wrapped with a pre Oracle 10g wrap utility. See also FAQ Is unwrapping code processed by the PL/SQL Wrapper of Oracle7, Oracle8, Oracle8i or Oracle9i supported?